What changes will make the 2018 Honda Civic different? A break from change is the news, following two very busy model years for Honda’s venerable compact car line. Figure no more than a new color choice or two for ’18 as Civic takes a breather from a rapid pace that began with the model-year 2016 launch of the first fully redesigned Civic since 2012. The all-new 10th-generation design premiered in four-door sedan form, followed by a two-door coupe. It’s bigger, sportier, more refined, and more fuel efficient than its 2012-2015 predecessor. Consumers responded: Civic sales are up nearly 14 percent through September 2016 – impressive, considering the compact-car market is down more than 5 percent. Honda aimed to sustain that momentum for model-year 2017 by re-introducing a hatchback body style to North America following a decade-long absence. The model-year ‘17 expansion continued with the midyear return of the sporty Si model and introduction of the high-performance Civic Type R, an iteration previously unavailable outside Japan and Europe. To get your hands on a Civic Type R, a 300-horsepower rocket for which Honda enthusiasts have been clamoring. The initial run of model-year 2017 Type Rs is apt to be limited in supply and sell out quickly — probably at above-sticker prices. Waiting for the ’18 could take some pressure off demand and discourage dealer markups. Otherwise, don’t expect much change, save for perhaps some new paint hues — and higher prices across the board. Note as well that model-year 2019 should bring midcycle updates that would give the entire Civic line slight appearance revisions and perhaps some new features. That means waiting for the ’18 will net you virtually the same car as a ’17 model, but with higher prices and styling that has a one-year shelf life. Finally, there’s an outside chance Honda could add a gas/electric hybrid model or a plug-in variant for 2018. We think this is more likely for model-year 2019, though. Yes. 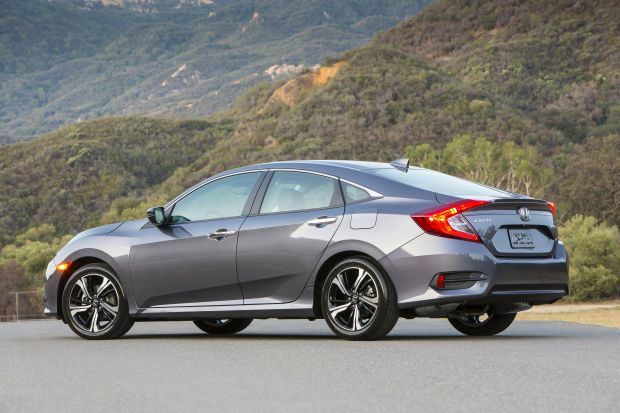 No matter the variant, Civic should be at the very top of your compact-car shopping list. Addition of the hatchback and performance models only enhances its appeal. Powertrain and equipment details are covered in separate sections below. The 2017 lineup for sedans ascends through LX, EX, EX-T, EX-L, and Touring trim levels. The coupe mirrors the sedan, except that an LX-P version takes the place of the EX. Hatchbacks offer LX, Sport, EX, EX-L Navi (navigation system), and Sport Touring variants. Full details on the 2017 Si and Type R were not release in time for this review, but expect the Si to be available as a sedan, coupe, and hatchback, with the Type R a hatch only. They’ll have exclusive engine and suspension specs and unique interior details, but equipment levels will otherwise fall between those of EX-L and Touring models. Honda hadn’t finalized the looks of the 2017 Si and Type R as of this report, but they’ll almost certainly carry over to 2018, as will those of the regular coupe, sedan, and hatchback. The performance models will have a notably more aggressive look, with low-profile tires, big alloy wheels, a prominent rear spoiler, and lower body aero addenda. The standard hatchback already has a sportier look than its sedan or coupe siblings, thanks to sharper front and rear fasciae. And instead of most exhaust outlets hidden beneath the rear bumper, Sport and Sport Touring models have dual ports that protrude from the lower center of the rear fascia, a look that’ll be shared with the Si and Type R.
Civic’s interior design should carry over as well. On the whole, that’s a good thing. Gone is the 9th generation’s subpar materials and goofy two-tier dashboard, replaced by a stylish and contemporary instrument panel and a blend of padded and solid-feeling surfaces that would be at home in a far more expensive car. Connectivity is good, as well, with EX and higher models including support for Apple CarPlay and Google Android Auto. These versions have a touchscreen infotainment system, as you would expect from a modern car. Available on the EX-L and standard on the Touring and Sport Touring is an embedded navigation system. It works fine, but includes audio-volume control through a touch-sensitive section of the screen. It’s finicky to adjust, and the redundant steering-wheel control is only a little better. Honda’s heeded the criticism, restoring a traditional volume knob to the similar systems in its redesigned 2017 CR-V compact crossover SUV. We think it’ll so the same for the Civic as part of its 2019 refresh. That’s otherwise a small complaint about this roomy and comfortable compact car. Not unless Honda surprises with a Civic hybrid. Otherwise, the balance of the ’18 line should carry forward with no mechanical changes. Every Civic – including the Type R – will again have front-wheel drive. All LX models, along with the LX-P coupe and EX sedan, will retain a 2.0-liter four-cylinder engine with 158 horsepower and 138 pound-feet of torque. Other Civics — except the Si and Type R — will have a turbocharged 1.5-liter four-cylinder. In the Sport and Sport Touring hatchbacks, the 1.5 turbo will have 180 horsepower and 167 pound-feet of torque. In the rest, it’ll have 174 horsepower and 162 pound-feet. Transmissions for LX, EX-T, and Sport models are a choice of a standard 6-speed manual or optional continuously variable automatic transmission (CVT). The CVT is standard on LX-P, EX-L, and Touring models. Si and Type R powertrain specs were not finalized as of this writing, though both will have a turbocharged 2.0-liter four-cylinder. Si versions will likely be rated 220-230 horsepower, offer the manual and the CVT, and compete with the likes of the 252-horsepower Ford Focus ST and 201-220-horsepower Volkswagen Golf GTI and Jetta GLI. The Type R will pack around 300 and come only with the 6-speed manual. Rivals include the 350-horsepower Focus RS, 305-horse Subaru WRX STi, and 292-horsepower VW Golf R – and each tames its power output with standard all-wheel drive. By contrast, Honda engineers have worked on the Civic Type-R’s suspension in an effort to mitigate torque steer, the bothersome tendency of a powerful front-wheel-drive car to pull to the side during rapid acceleration. EPA ratings should be unchanged, meaning that for a lineup without a hybrid or “fuel-economy special,” the ’18 Civic should again be a very fuel-efficient compact car. With the base 2.0-liter engine, Civic sedans should again rate 28/40/32 mpg city/highway/combined with manual transmission and 31/40/34 with the CVT. The 1.5-liter turbo versions should repeat at 31/42/35 mpg with manual transmission and 32/42/36 with the CVT. The coupe doesn’t do quite as well. It’s 2.0-liter models should again rate 28/39/32 mpg with the manual and 30/39/34 with the CVT. Expect the 1.5-liter turbo to state at 30/41/35 mpg with the manual and 31/40/35 with the CVT. Among hatchbacks, the LX hatchback rates 30/39/33 mpg city/highway/combined. With the CVT, the LX, EX, and and EX-L Navi rate 31/40/34 mpg. The Sport rates 30/39/33 mpg with the manual and 30/36/32 with the CVT. The CVT-only top-line Sport Touring also rate 30/36/32. EPA rating for the Si and Type R hadn’t been released, but Honda is likely to recommend premium-grade 91-octane gasoline for the former and require it for the latter. The automaker recommends but doesn’t require premium for the Sport and Sport Touring hatchbacks. All other models use regular-grade 87-octane fuel. Unless the Honda Sensing suite of safety features and driver aids becomes standard on more than just the flagship trim levels, don’t count on it. Honda Sensing would otherwise remain standard on the 2018 Touring and Sport Touring models and a $1,000 option on all other CVT-equipped Civics. This package includes lane-departure warning with automatic steering correction, adaptive cruise control, and automatic high-beam headlights. It also includes autonomous emergency braking that’ll stop the car to mitigate a frontal collision. 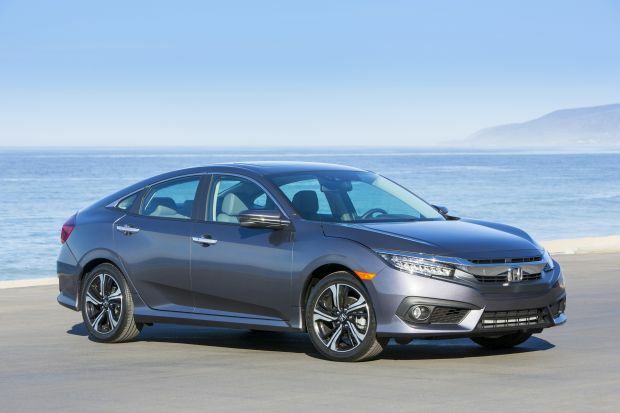 Civics equipped with Honda Sensing earn the coveted “Top Safety Pick+” rating from the influential Insurance Institute for Highway Safety. A kudos to Honda for making Honda Sensing available on most Civic models rather than limiting it to the priciest variants (looking at you, Hyundai). Rival Toyota, however, is making most of these features standard on its compact Corolla, and they’re doing it while raising asking prices by less than $500 on average. As for other features, expect even base 2018 Civic coupes, sedans, and hatchbacks to again come with a fair amount of kit including automatic climate control, rearview camera, and Bluetooth connectivity. LX-P and EX models add pushbutton ignition, remote engine start, and a power sunroof. Honda’s LaneWatch blind-spot camera is standard on EX and higher models, along with CarPlay and Android Auto. EX-T versions gain heated front seats and dual-zone automatic climate control. EX-L coupes and sedans have leather seating surfaces and a power driver’s seat. The hatchback EX-L has this plus a navigation system, which is optional on the coupe and sedan. At the top of the roster, Tourings have GPS navigation, LED headlights, and heated outboard rear seats. They’ll probably rise a bit. Honda increased coupe and sedan prices by only about $100 for model-year 2017. Expect a similar increase for ’18, unless they make a major shift in feature availability. Sedans will likely span a price range of about $19,600-$28,500, including destination fee (which was $835 on 2017 models). Coupes will trend about $300 higher than their sedan counterparts. Hatchbacks should run from about $20,500-$28,500. Honda has not announced official prices for the 2017 Civic Si and Type R. We expect the former to run from about $25,000-$29,000, depending on the level of equipment. The Type R will likely retail in the $35,000 range, which is notably less than its AWD rivals from Ford, Subaru, or Volkswagen. Expect a 2018 Honda Civic release date in fall 2017. Addition of a hybrid of some kind would be good, especially since Honda recently re-released a gas/electric version of its Accord sedan. We wish the Type R was AWD. We’ll see how that handles when it becomes available in early 2017. A dedicated volume knob for the infotainment system would fix our biggest complaint about that; we think Honda will fix this for ’19.